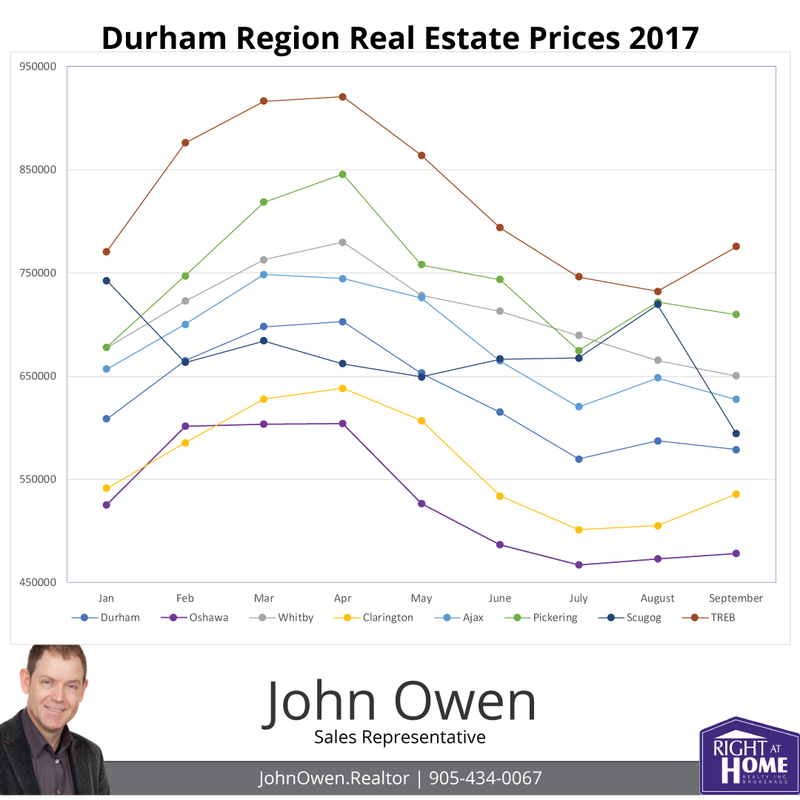 Whitby's real estate market for residential properties continued to fall off from the record highs experienced this spring, and was the only community in Durham Region to experience five straight months of price drops, even though the average price was 9.1% over last September. The Toronto Real Estate Board's (TREB) latest market stats put the average Whitby property selling at $650,361 - up from last year's 596,363 by 9.1%, but well down from April's $779,677. The average selling price of homes in the GTA this September was $775,546. This represents a 2.6% increase over 2016. Sales volume fell 35.6%. Active listings also increased - 69.0%, which demonstrates a shift in market fundamentals. The rise in inventory helps to make the market more balanced - more inventory means less competition for listings by buyers, and less bidding wars. The MLS Home Price Index helps to normalize the statistics, by adjusting sales statistics to represent typical homes within MLS areas. 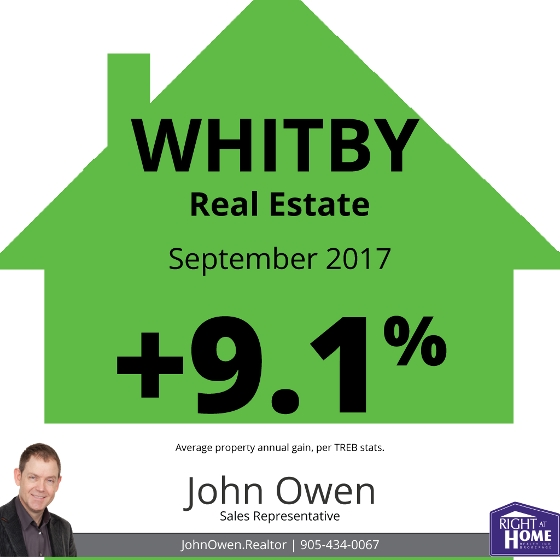 When using these numbers, Whitby showed a composite annual gain of 11.04%, compared to the TREB average of 12.22%. Inventory levels continue at low levels with 1.5 months of inventory on hand across the board. This means that a current sales levels, all of the property would be bought up in the GTA in 1.5 months (if no new listings were added). Overall, there is only 1.3 months inventory in the Durham area. In Whitby, there is just 1.1 months of inventory. 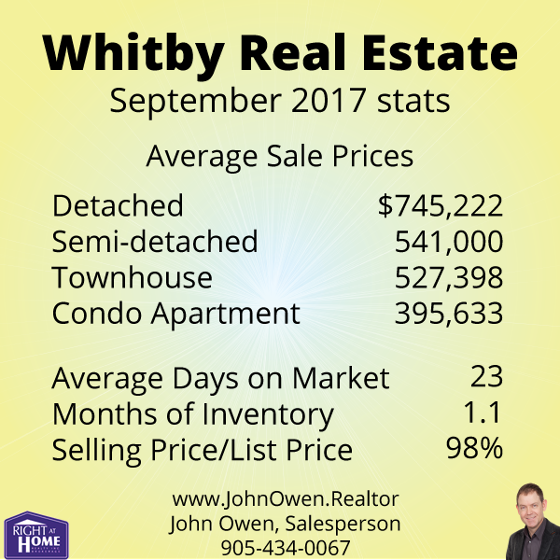 The average listing in Whitby spent 23 days on the market. The TREB average was 21 days.